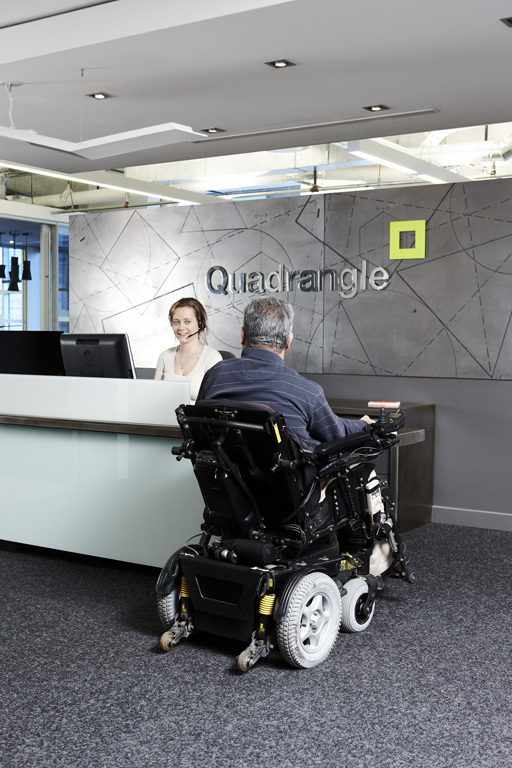 Quadrangle’s Studio incorporates the firm's central tenets of creativity, accessibility, sustainability and collaboration in a bright and spacious contemporary office. 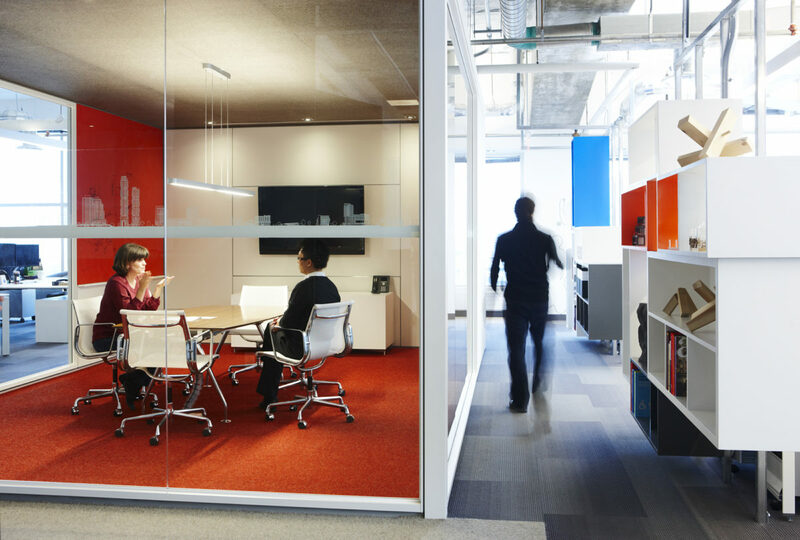 This award-winning space spurred the transformation of its 1990s building into a creative hub, exemplifying how a holistic approach to design can revitalize a building. Core members of the Human Space* team brought their expertise to the table when designing the Studio. Sustainability Strategist Michelle Xuereb worked with the Quadrangle Interiors team to ensure that sustainability was embedded into every aspect of the project, from the creative reuse of materials taken from the old office to the installation of state-of-the-art daylight and motion sensing lighting systems. Accessibility Champion Susan Ruptash led the process in making the Studio an exemplar for universal design principles. Going beyond minimum requirements and unpacking strategies around inclusion and accessibility, Susan’s vision was realized by the seamless integration between strategic accessible design elements and beautiful design. Health and wellness for Studio members was also taken into consideration when the team strategically removed individual garbage containers and eating at workstations, encouraging movement away from the workstation and impromptu opportunities for collaboration. Studio members also benefit from the democracy of light; windows surround the perimeter and meeting rooms are glazed to ensure continuous access to natural light. The reception desk was custom-designed to include an extended edge with knee clearance. The model-making station in the materials library was intentionally designed with work surfaces placed at varying heights. The team designed a spacious universal washroom. All glazed meeting rooms use vision strips that feature sketches of Quadrangle-designed buildings. 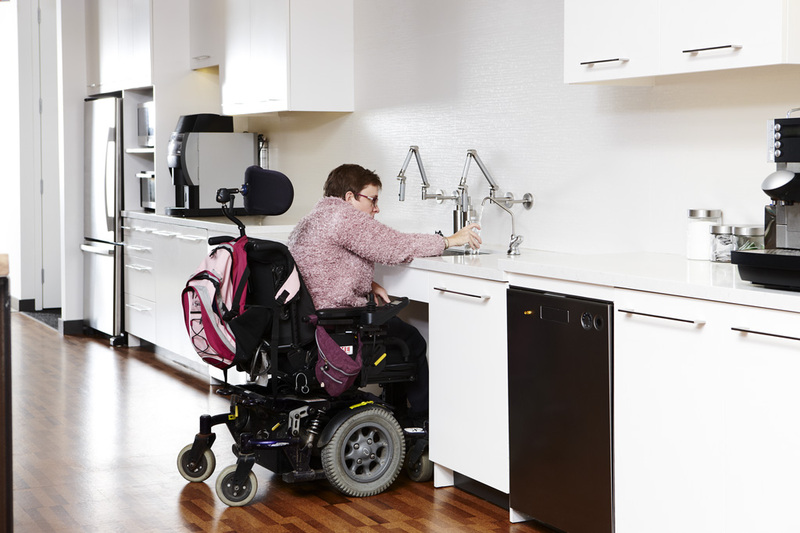 The lunch room was designed so that it can be used by persons who use mobility devices and persons of shorter stature. 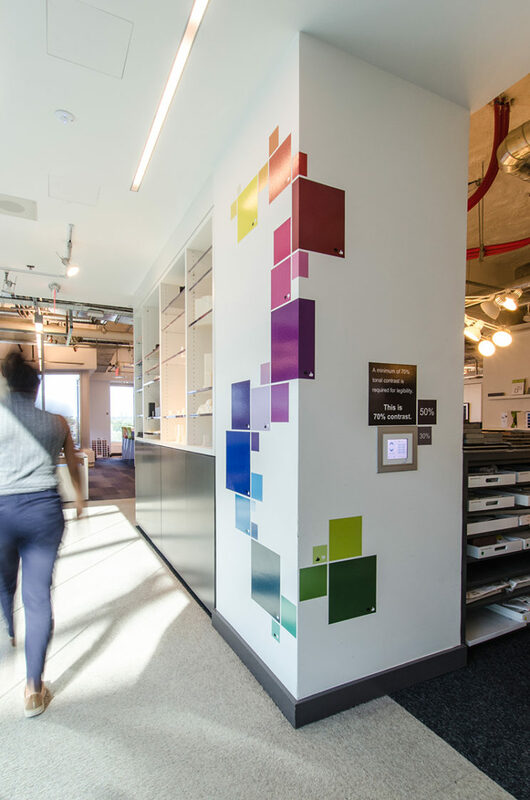 The Studio is decorated with informative graphics that relate to accessibility, such as this wall decal demonstrating best practices in colour contrasting. 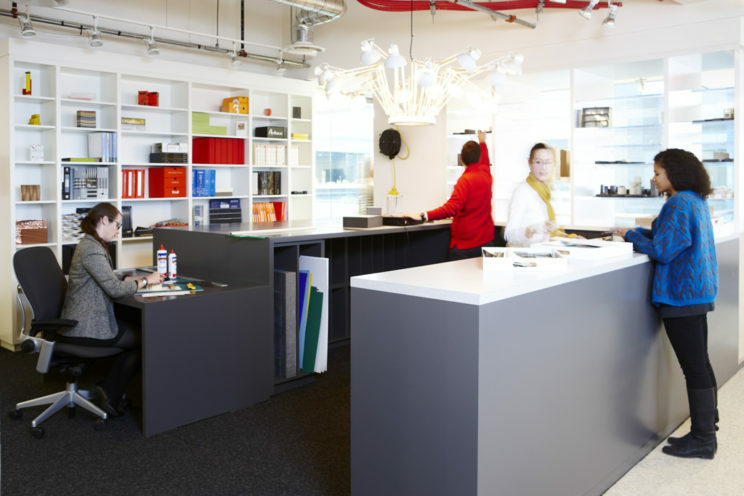 The Quadrangle Studio is an example of how universal design principles can be seamlessly integrated into beautiful workspaces.